Michelle Obama’s love of affordable fashion is showing no signs of waning, with the fashionable First Lady stepping out in Gap this week for a White House lunch. Mixing high street and designer with ease, Mrs O donned Gap’s striped tee and coordinating floral cardigan, teamed with a white Michael Kors skirt, for a lunch with former First Lady Nancy Reagan. But this isn’t the first time that the stylish politico has stepped out in high street pieces for high profile events. 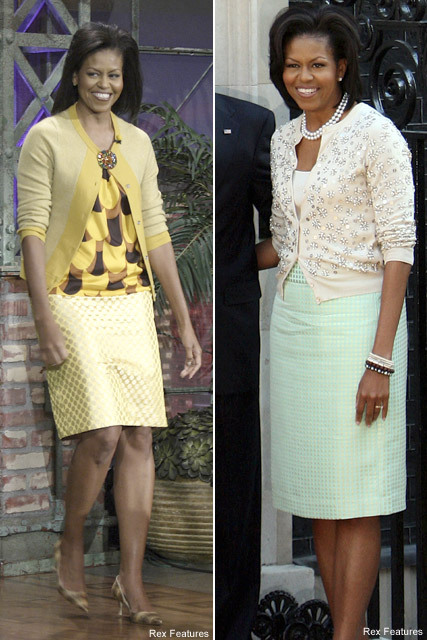 When appearing on The Tonight Show during her husband’s campaign trail, she wore a full J.Crew ensemble – a yellow skirt, printed blouse and matching cardi – a look that was the perfect antidote to the raging scandal surrounding Sarah Palin’s $150,000 wardrobe bill. Once President Obama was in office, the high street buys kept on coming, and the First Lady sparked a shopping frenzy, when she wore J. Crew’s crystal embellished cardigan for a London photocall at 10 Downing Street. Proving affordable fashion can be just as chic as its designer counterparts, you can’t help but applaud Mrs O for her bargain style saviness. Michelle, we salute you!